President and Mrs. Bush in Africa on April 4, 2017. Photo by Paul Morse. On the benches in the central waiting area of the Tsopeng health clinic in Lobatse, Botswana, Kutlo Nkuetsho, a shy, soft-spoken mother of three, waits to see a doctor. On this morning, she traveled by bus to Lobatse—a sprawling town, encircled by hills, close to the border with South Africa—prepared to hear bad news, convinced that she had cancer. A few years ago, Kutlo began experiencing pain and feared something was wrong. 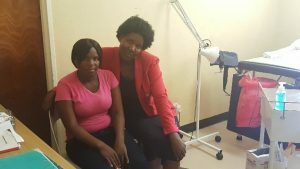 A series of visits to health care providers yielded few answers; although she received a Pap smear, she was never told the result or what she should do next, a common outcome of doing Pap smears in resource-limited health centers. Then, in 2016, when Kutlo was seeking family planning services, a nurse put the pieces together, identifying her precancerous lesions during an exam and referring her for LEEP, the loop electrosurgical excision procedure used to remove large precancerous cervical lesions. The Tsopeng health clinic, where Kutlo now waits anxiously, has been at the forefront of the national cervical cancer response in Botswana. In 2015, the Ministry of Health and Wellness (MOHW) launched national “see-and-treat” services here, with support from the President’s Emergency Plan for AIDS Relief (PEPFAR), the Centers for Disease Control and Prevention (CDC) and Pink Ribbon Red Ribbon, an international nonprofit affiliated with the George W. Bush Institute. 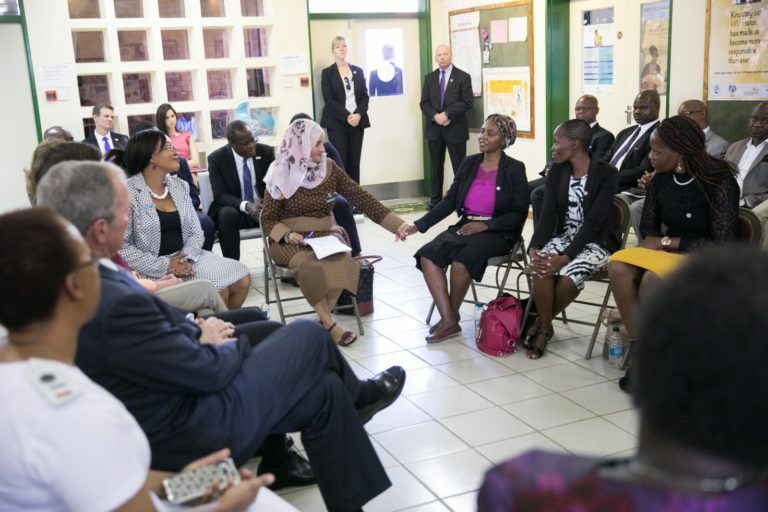 President Bush and his wife Laura visited Botswana this month and a clinic offering the Institute-supported cervical cancer prevention and treatment services. Nurse Rose Ditlhong has witnessed the remarkable growth of cervical cancer services at the clinic. As Principal Registered Nurse at Tsopeng and District Coordinator of the National Cervical Cancer Prevention Program, she vividly remembers the days, not so long ago, when women and the health care providers who care for them lacked the simple tools and procedures to adequately screen as part of prevention services. Women would come in with advanced cervical cancer, and there was little the staff at the clinic could do to stop it. 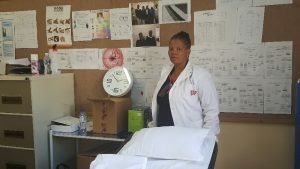 “I am so hurt to see a woman coming in with cancer,” Nurse Ditlhong says. The frustration she feels in these cases is palpable. She knows that if a woman’s precancerous lesions are caught early, her cancer can be prevented. On this hot, dry day, as the clinic fills up with women who have come for screening and follow-up treatment for precancerous lesions, it is apparent that things have started to change. The national cervical cancer prevention strategy, which includes a see-and-treat approach to immediate care, emphasizes nurse-led, frontline screening using a technique known as VIA (visual inspection with acetic acid) and same-day treatment with cryotherapy for smaller lesions and with LEEP for larger lesions. Because VIA and cryotherapy can be provided by nurses, the MOHW is scaling up this service in clinics throughout Botswana with the help of Jhpiego’s technical expertise and through support from PEPFAR, Pink Ribbon Red Ribbon and CDC. Since the launch of see-and-treat services, more than a dozen clinics have started offering VIA and more than 7,700 women have been screened for cervical cancer. Rose Ditlhong. Photo by Alisha Smith-Arthur. Nurse Ditlhong can see the difference. Women come to the Tsopeng clinic for cervical cancer screening 5 days a week now, referred by their friends and relatives. When women know they can get treatment early, fast and all in one place, she says, it gives them peace of mind. “Are you telling us cervical cancer is preventable?” they ask her. She assures them that it is, comfortable in the knowledge that she has the tools to help them. “Every woman who comes here will get her results right away,” she says proudly. Onkabetse Medupi, a young doctor from Tsabong, a small town in the Kalahari Desert west of Lobatse, shares Nurse Ditlhong’s enthusiasm. He’s come to Lobatse today to learn see-and-treat skills—specifically, the more complicated LEEP procedure—from MOHW and Jhpiego trainers. Like Nurse Ditlhong, he has seen too many women whose cervical cancer was identified too late, and has been upset by the knowledge that he couldn’t do more to help them. Now, he says, he’ll take his new skills straight back to his clinic where they already have clients eager to be served. Women like Kutlo Nkuetsho keep Nurse Ditlhong going. She and her staff have worked hard to inform their clients and communities that cervical cancer is preventable. When she sees women come in for screening, she says, “I think of my auntie, my sister, my cousin.” It motivates her to go into her community, to work with village health committees to get the word out about cervical cancer and what providers are doing at the Tsopeng clinic. With the training and support she’s received from Jhpiego, Nurse Ditlhong is able to answer their many questions: “It’s now that they understand, because we also understand.” In Lobatse, this understanding energizes a new drive to stop a fearful disease, and encourages the clinic staff and their counterparts at Jhpiego and the MOHW to continue their work to prevent cervical cancer. Kutlo Nkuetsho and Bakgaki Ratshaa, Jhpiego CECAP Technical Advisor. Photo by Alisha Smith-Arthur. Toward the end of the morning, the benches at the clinic slowly start to empty. Kutlo Nkuetsho is among the last patients to be seen, but she didn’t mind the wait. She walks out of the LEEP clinic with a profound sense of relief. Her precancerous lesions have been treated. It wasn’t even painful, as she had feared it would be. She understood the dangers of cervical cancer and was willing to keep trying, to keep coming back to get help. Now she doesn’t need to worry anymore, and she says she is going home a very happy woman to tell her sister that she should be screened as well. Alisha Smith-Arthur is a Senior Program Officer-Eastern African region for Jhpiego.